Attend It’s My Park Day October 19 at Harlem’s Morningside Park | HarlemGal Inc. Interested in volunteering this weekend? 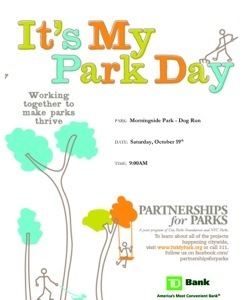 It’s My Park Day is happening Saturday, Oct. 19th at Morningside Park in Harlem. Work begins at 9 am at the dog run and will consist of putting down fresh wood chips. See details below. This entry was posted in Community, Events, Free!, Harlem, Harlem bloggers, Harlem blogs, HarlemGal, Morningside Park, Things to do in Harlem and tagged Harlem, Harlem bloggers, Harlem Blogs, It's My Park Day, morningside park, volunteer. Bookmark the permalink.